“This purse is perfect for me.” I wish. It’s beautiful. It’s so not perfect for me. I’m still going to use it, but I have things to say that I wish I’d known before I dropped $109 on it on ebay. At least it wasn’t full-price of $209. “The handle is comfortable….” Lies. The first two days I had to keep asking someone else to carry it for me. The rolled handle cut into my shoulder so badly that I ended up asking my fifteen-year old with a third degree sunburn to carry it. I’ve since adjusted, but flatter is better. I also carry an iPhone, a small Verizon LG flip-phone, a wallet, a small leather notepad, and $5.00 in coins. Just a mention. But I also carry these things in my other B. Mak with no problems. “[T]he bag drapes beautifully and has the soft glove leather feel that B. Makowsky is known for; I love the minimal silver hardware.” Well, that hardware is Not Kosher. It is minimal but it is so heavy that I’m scared I’m going to knock myself out with it. It could seriously be used to defend myself. Another problem is that the bag is constructed of such soft leather that when the bag is opened, the two heavy pieces of hardware come together in the center where my hands want to be to pull out a lip gloss or something. And if I hit my hand on one of those minimal hard-wear pieces, I’m gonna feel it. On the shoulder, reaching into the bag to grab keys or something is not easy. The strap drop may be a little too short for that (9″) given the opening and heavy hardware. Or it could be that I’m trying to reach into the bag with only one hand since the other hand is always holding something else. “I like the non-divided interior of this bag. I can slip a purse organizer into the bottom and keep everything sorted and upright around the edges.” True. I use the Purseket and this works fairly well. I think the large purseket might have done better though. Unsure – I have medium. “[A]nd the Shitake color” is to die for. Love it for summer. Such a nice grey-ish brown. That’s all I have to say about that. I am in love with this purse from a distance and I still can’t keep my hands off of it. It’s soft and it has soft fringe that my fingers are constantly running through, but the design needs tweaking before it’d be perfect for me. 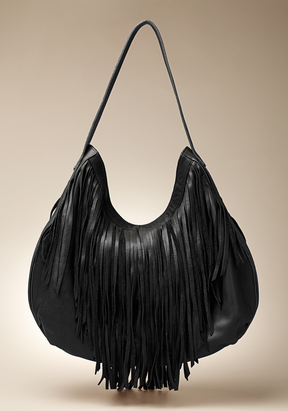 My other new purse is this black Bryna Nicole and it’s not been delivered yet. I’ll report on that when it gets here. 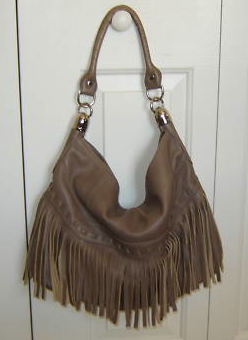 It is a fringe purse for winter that I couldn’t do without. 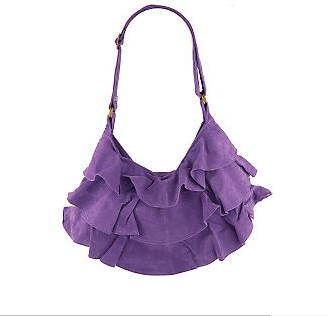 Now, which color ruffle bag do I want: purple or orange (Texas and Illinois). 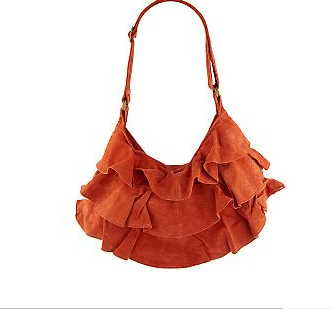 This is an inexpensive bag coming in under $50, so I want it. It’s washable suede. I don’t even know how they do that. I think I’d love it in a dark gray, but that’s sold out. I’m leaning orange. Bear in mind that I already have two purple purses: the Coldwater Creek bag (Kate doesn’t like it – “cheap” she opines) and a Merona (Target) purple clutch with a large silver hoop wrist ring that I love and use often. Deep purple is so versatile. My question is why are the beautiful purses the expensive ones? You can say they’re not worth it, and depending on your values for “worth it,” they’re not. But if you want a soft, beautiful, well-made, lifelong kind of purse, you’re going to pay for it and then take care of it. Which is why my Rebel B. Mak is sitting in its dustbag in the closet right now. I love that purse. Tod’s “D” Bag, size “Media” $1445.00. 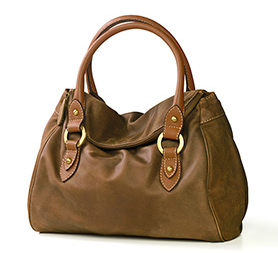 I mean, why can’t I like this satchel for $129 from Coldwater Creek? IT HURTS THAT YOU EVEN HAVE TO ASK. And what about animal prints? 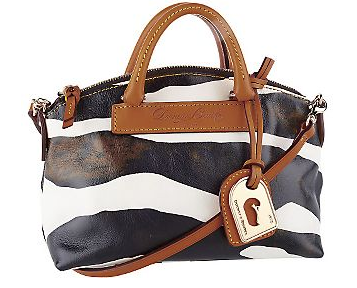 I’m kind of in love with a Dooney & Bourke zebra print bag . . . and I’ve never, ever carried an animal print. But don’t you think this is just simply amazing? 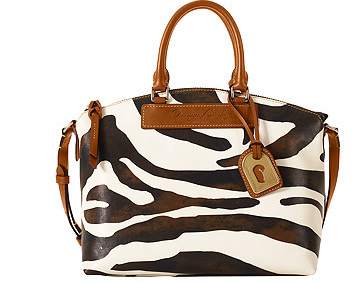 The Dooney & Bourke leather zebra collection satchel, $275. Or its kid sister, the Juliette Mini, $165.00? I actually want this one in mustard, which is more akin to the color of a baseball glove than yellow, but it doesn’t photograph well. Yeah. I’m studying for the MPRE. I’m writing a memo on canine DNA, rewriting my Note (which I haven’t even re-read), and studying statistics (which book I haven’t even removed the plastic wrap from). Not shopping for purses. Just thinking about bags. Which reminds me that I need a tote for work. None of this briefcase and a purse. My manly briefcase needs a tote. So, do I want the Fendi ‘Classico No. 4’ Leather Tote, at least right now? Don’t even ask. Or this dark purple Yves Saint Laurent Large Muse Two tote? We’ll just go out on this one. $1295.00. If I go into a coma, for some unknown reason, and I wake up a size 2, I want this Fendi dress too, okay? Fendi not flowers. The Tod’s “D” Bag, size “Media” $1445.00? Yesyesyes. So glad someone agrees. :) I’m still trying to decide on an appropriate real-world substitute until $1445 somehow doesn’t seem like an outrageous price. Trip to Europe starter account? Tod’s bag? Brad Paisley concert with the kids? Tod’s bag? I mean, c’mon. This is killing me!